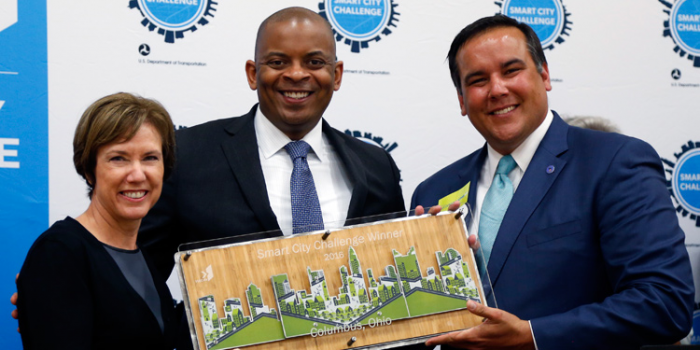 U.S. Transportation Secretary Anthony Foxx announced last week that Columbus, Ohio has been selected as the winner of the U.S. Department of Transportation's Smart City Challenge. As winner of the Challenge, Columbus will receive up to $40 million from U.S. DOT and up to $10 million from Paul G. Allen's Vulcan Inc. to supplement the $90 million that the city has already raised from other private partners to carry out its plan. Using these resources, Columbus will work to reshape its transportation system to become part of a fully-integrated city that harnesses the power and potential of data, technology and creativity to reimagine how people and goods move throughout their city. Secretary Foxx said, "The Smart City Challenge required each city to think about transportation as cross-functional, not in silos, but as a transportation ecosystem. The bold initiatives they proposed demonstrated that the future of transportation is not just about using technology to make our systems safer and more efficient – it's about using these advanced tools to make life better for all people, especially those living in underserved communities. While Columbus is the winner of the Challenge, we believe each city has come out of this process with a stronger sense of how to address transportation challenges with technology and innovation." "We are thrilled to be America's first Smart City," said Mayor Andrew Ginther. "Smart Columbus will deliver an unprecedented multimodal transportation system that will not only benefit the people of central Ohio, but potentially all mid-sized cities. I am grateful to President Obama, Secretary Foxx, the U.S. Department of Transportation, all of our partners and especially the Smart Columbus team." U.S. DOT received 78 applications in total – one from nearly every mid-sized city in America. The Challenge called on cities to do more than introduce new technologies onto city streets, requiring them to envision new solutions that would change the face of transportation in cities by closing the gap between rich and poor; capturing the needs of young and old; and bridging the digital divide through smart design so that the future of transportation meets the needs of all city residents. The seven finalist cities that were announced at South by Southwest (SXSW) in March – Austin, Columbus, Denver, Kansas City, Pittsburgh, Portland and San Francisco. They presented innovative concepts, proposing to create new corridors for autonomous vehicles to move city residents, to electrify city fleets and to collectively equip over 13,000 buses, taxis and cars with vehicle-to-vehicle (V2V) communication. Columbus was selected as the winner after puting forward a holistic vision for how technology can help all of the city's residents to move more easily and to access opportunity. The city proposed to deploy three electric self-driving shuttles to link a new bus rapid transit center to a retail district, connecting more residents to jobs. Columbus also plans to use data analytics to improve health care access in a neighborhood that currently has an infant mortality rate four times that of the national average, allowing them to provide improved transportation options to those most in need of prenatal care. Public-private partnerships were essential to the Smart City Challenge. The Department announced partnerships with launch partner Paul G. Allen's Vulcan Inc., cloud partner Amazon Web Services, NXP Semiconductors, Mobileye, Autodesk, Alphabet's Sidewalk Labs, AT&T, DC Solar and Continental Automotive. In addition, the seven finalist cities were able to leverage U.S. DOT's $40 million grant to raise approximately $500 million more in funding – a majority of which comes from a diverse group of over 150 partners. The Department of Transportation and its federal partners, including the Department of Homeland Security, the Department of Energy and the National Institute for Standards and Technology, have committed to keep working collaboratively with the seven finalist cities to identify potential federal, state, local and private resources to help carry out their Smart City plans. And Vulcan Inc. announced a new commitment to provide additional funding to support the climate and electrification efforts of all seven cities.